In Photoshop and in Lightroom, as well as in most image-editing apps, we can control the color in our photographs. We can increase color by increasing saturation, and we can reduce color by reducing saturation. Increasing contrast can make colors more vibrant, and vice versa, too. Adjusting Levels and Curves can also change the color in an image. We can use plug-ins and apps to add and reduce color. We can also correct color. Perhaps, most importantly, we can have fun with color. In this installment of Quick Fix, I’ll share a couple of my favorite images from Myanmar, intensifying the color in one image and altering the color of the other. I’ll also include a quick photo tip for each image. Here’s the file from which I created the opening image for this column. 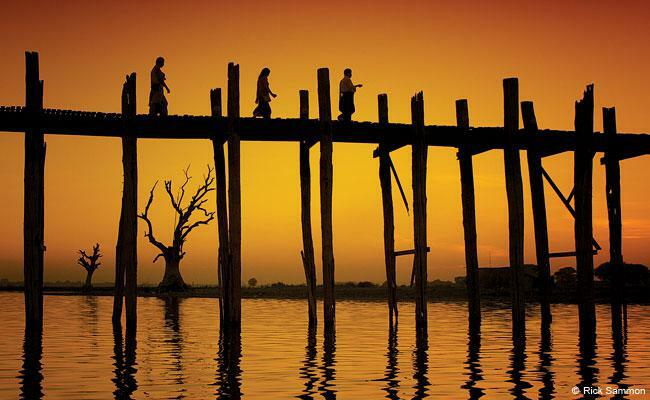 I took this photograph in Mandalay on one of the longest teak bridges in the world. As you can see, the sky wasn’t bursting with color as I had wished. If I had been shooting slide film, I would have been disappointed, but because I shoot digital and use Photoshop (and Lightroom), I knew that I could add and enhance the color and come up with an image with impact. My first step was to crop the image. I’m big on cropping, as cropping gives us a second chance at composition. To add the color, I used the Orange Graduated filter in Nik Color Efex Pro, a plug-in that works with Photoshop, Lightroom and Aperture. Other options for adding color to a sky include using the Gradient filters in Lightroom and Adobe Camera Raw. After I added the Nik filter, I applied the Darken/Lighten filter in the same plug-in (by clicking on Add Filter). I use this filter quite often, as do many pros. Ansel Adams, perhaps the most famous landscape photographer of all time, created the same effect in the wet darkroom. He said, "A picture is not complete until you darken the edges." Photo Tip: One of the elements that makes this picture interesting is separation. In this photograph, the trees are separated from the pilings on the bridge, and the people on the bridge are separated from each other and the posts on the bridge. In silhouettes, separation of the objects in the scene is especially important.